FFA - Many American Patriots speak out against Islamist rally in Garland Texas. Please consider sending an email to urge officials not to allow school property to be used in the future to wage the Islamist propaganda war on America. Click here to send follow up email to Garland Independent School District officials to urge them not to allow school property to be used in the future to wage the Islamist propaganda war on America. The Sound Vision Foundation, “a not for profit organization serving Muslims,” sponsored the event. Their website promoted the event in part with: Ready to defeat Islamophobia? This is not an event. It is the beginning of a movement. A movement to defend Prophet Muhammad, his person, and his message. Salla Allahu Alaihe wa Sallam. This benefit will raise funds to establish a Strategic Communication Center for the Muslim community, which will develop effective responses to anti-Islamic attacks, as well as to train young Muslims in media. 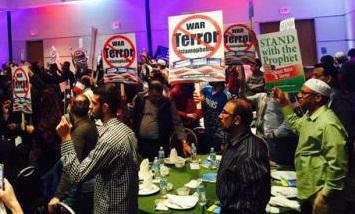 Clearly, the purpose of this event was to rally Muslims against American patriots who are rightfully concerned about the Islamist movement in the United States. More than 7,000 people sent emails through Floridafamily.org to each Garland Independent School District and Curtis Culwell Center official. On January 6, 2015, Act for America Houston posted Florida Family Association’s article regarding the Islamist rally on their website. On January 13 and 14, 2015, Bill O’Reilly warned viewers about the Garland Texas Islamist sponsored “anti-Islamophobia” conference. FoxNews.com reports: Siraj Wahhaj, a radical imam whom O'Reilly discussed earlier this week, runs the Masjid At Taqwa mosque in Bed-Stuy, Brooklyn. Wahhaj will be speaking at an upcoming conference in Texas. Mauro called him "one of the most radical imams in the country." Ryan Mauro is a National Security Analyst for the Clarion Project, which studies extremism. On January 14, 2014 Breitbart.com reported on the Islamist rally. Breitbart.com reporter Merrill Hope received Florida Family Association’s email alert from a friend and called to ask about the conference. Ms. Hope inquired about why the event was not posted on the Curtis Culwell Center’s schedule. It appeared that school district officials were most likely hiding the rally from the public. Breitbart.com posted several articles about the Islamist rally. On January 15, 2015, TeaParty.org reported Anti-Islamist Activist Pamela Geller Plans Counter-Strike at ‘Stand with the Prophet’ Conference. The Tea Party helped organize local citizens to protest the Islamist rally. On January 17, 2015 Pamela Geller with American Freedom Defense Initiative organized a picket of the Islamist rally. Unfortunately, school district officials allowed the Islamist rally to take place. Nevertheless, the heavy protest from Florida Family Association supporters and numerous other organizations sent a strong message to public officials across America regarding the hosting of Islamist anti-American rallies. Please consider sending the email prepared by Florida Family Association to urge Garland Independent School District officials not to allow school property to be used in the future to wage the Islamist propaganda war on America. Please click here to send your email to Garland Independent School District officials.